A Meditation Machine is a unique invention that has a multitude of uses: to aid meditation, improve memory, learning capabilities and visualization techniques, or simply to unwind or improve the quality of your sleeping patterns. This is achieved by the revolutionary light-frames – special glasses inset with LEDs (light emitting diodes). These lights flash and are synchronized with specific sound patterns that are received through the headphones. By presenting the pulsed audio and visual stimulation to the brain, after a short time the brain starts to resonate at the same frequency as the stimulus. The various areas of the brain integrate into one harmonious unit, providing focus for the brain while quietening internal dialogue or chatter , which occurs passively and without any conscious effort, allowing you to become a Master of Meditation ! Meditations Machines are so easy to use: simply connect the control unit to your CD player (if you wish to have music to accompany the session), plug in the light-frames and choose from 49 sessions that include deep relaxation, regeneration, tranquillity, energy, well-being and visualisation. Every individual purchase is accompanied by weekly tips and exercises sent direct by the Meditations Team, and cover numerous exercises on how to concentrate the mind, improve focus, as well as increasing the power of affirmations, dispelling negative thinking and achieving a more joyous everyday state. Each machine comes with headphones, light-frames, editor software ( which allows users to create and download their own sessions), carry-case, audio and PC connector leads, and a sample audio CD that contains some beautiful, relaxing tracks that when used with the machine creates a fantastic light show. The Meditation Machines range from £85 to £235 which includes next day delivery in the UK. 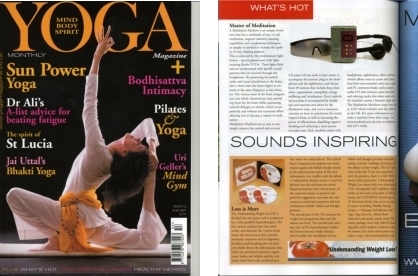 For more information or to order a machine from the range, visit www.Meditations-UK.com, or telephone 020 8371 0436. >Please click here to return to previous page. Get our FREE guide 'About Stress' and start to relieve stress today.